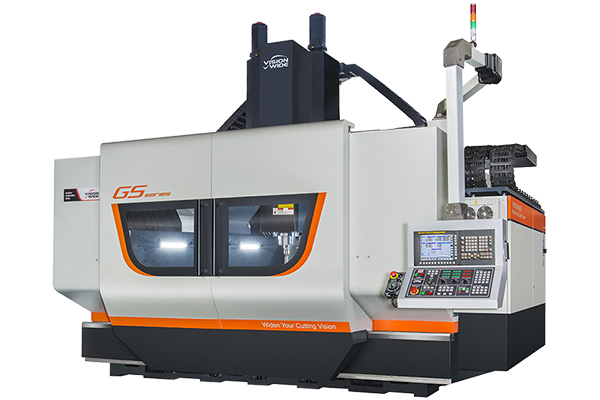 GS series, the Gantry Type CNC milling machine center of Vision Wide, featured with box structural design that is suitable for limited working space, and its one-piece design of work table and columns provides stable, speedy feeding performance that meets precision mold and aluminum cutting requirements. GS performs efficient productivity with powerful spindle and best structural configuration that give you smooth and fine surface within available time. Its maximal rapid traverse of 3 axes reaches 24 m/ min, and maximal cutting feed-rate is 24,000 mm/ min. Combination of columns, bed, and table in one piece casting, the Pyramid type weight distribution by spindle, ran, cross beam and bed arrangement. X-axis with dual direct-driven servo motor, plus dual linear scales can ensure positioning accuracy at high speed motion. Z-axis is direct-driven, by servo motor prevents the error from indirect-driven between mechanisms, and decreases power consumption, and improves Z-axis motion performance efficiently. Direct-driven spindle 10,000/15,000rpm, low noise, backlash, vibration and power consumption can ensure high work-piece surface accuracy after rapid cutting. Low table height, closer operating zone, wider door width are convenient design for user. Chain type chip conveyor (standard) is able to remove iron chips efficiently.